and apparently, as reported at the time, in .22 Rim-fire guise already out-shooting and out-grouping the .310" Martini Cadet rifle ( effectively the B.S.A. Model No.4 rifle )at 100 yards, although weather conditions may also have been a factor here. 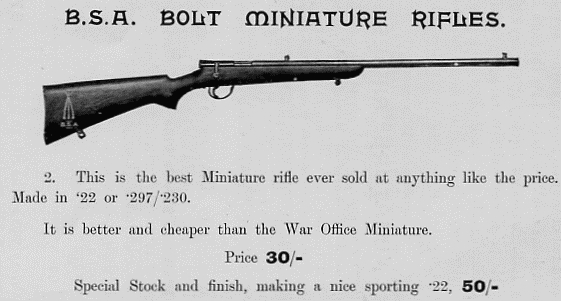 The Model No.2 was also serious competition for the War Office Pattern Miniature rifle, also manufactured by B.S.A. under contract to the War Office of the British Government. Indeed, the No.2 also used B.S.A. 's patent bolt design (No.14373 of 1907) developed for the W.O.P. Miniature rifle. 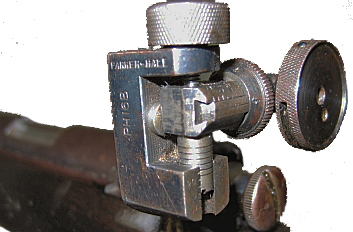 This bolt featured a recess in the bolt-head to accommodate the base of the .22 rim-fire cartridge and to protect the firer in the event of a "blow-back" from a split cartridge case. The soft copper cases utilised for these cartridges were prone to such failures in the early days. As can been seen by reading this advertisement in the B.S.A. catalogue of the year in which the rifle was first marketed, The No.3 Model was simply a virtually hand built Model No.2 with selected walnut furniture and especially finished metalwork. 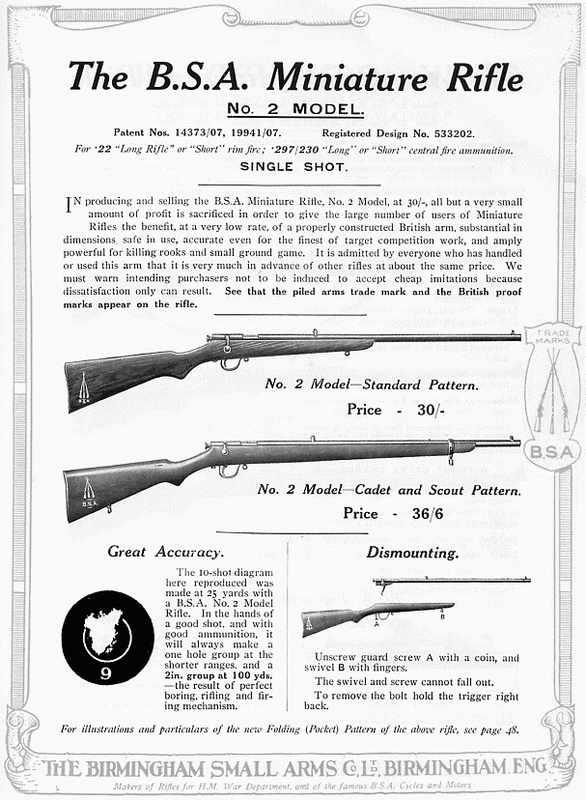 Priced, in 1910, at 30 shillings (£1.50) for the standard rifle and 50 shillings (£2.50) for the Special No.3 Model. 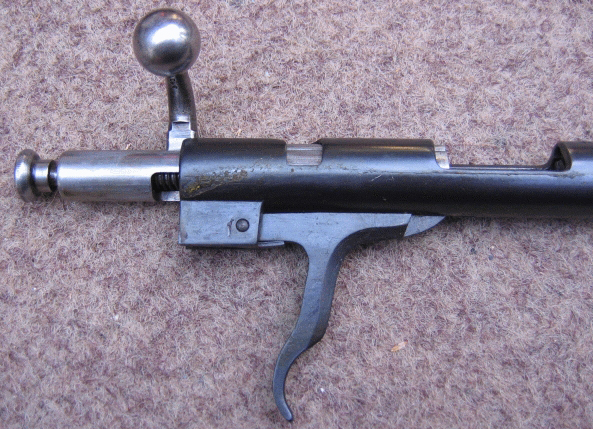 For comparison, the War Office's own Miniature Pattern rifle sold at 45 shillings ( £2.25) but was less accurate, possibly because of the Metford style rifling system specified by the War Office, conceivably with the purpose of reducing fouling of the barrel by the black-powder propellants of the day. In the event, the advent of semi-smokeless nitro based powders made such provision virtually unnecessary, and the carefully designed shallow groove concentric rifling favoured by B.S.A. and other manufacturers certainly won the day. L.R. Tippins ( Luke, father of John) advertised B.S.A. rifles of all kinds in his 1910 catalogue. He held a high opinion of the company's products and was not afraid to report such; he held definite and not unreasonable opinions of the shortcomings of the Government and its modus operandi in relation to the design and issue of Service rifles in the early part of the Twentieth Century; neither was he afraid to comment on these matters in public. His book - "Modern Rifle Shooting" ( 1900 ) (see Recommended Reading) carried highly critical comment on the directions the War Office took in arming the British soldier, and such comment was carefully modified though several editions up to 1906, the period in which the new "Short" Lee-Enfield rifle of that period. The barrel markings with patent number and the same designation " Cartridge .220 Long Rifle"
The Model No.3 was still available as a special finish version of the No.2 Model. 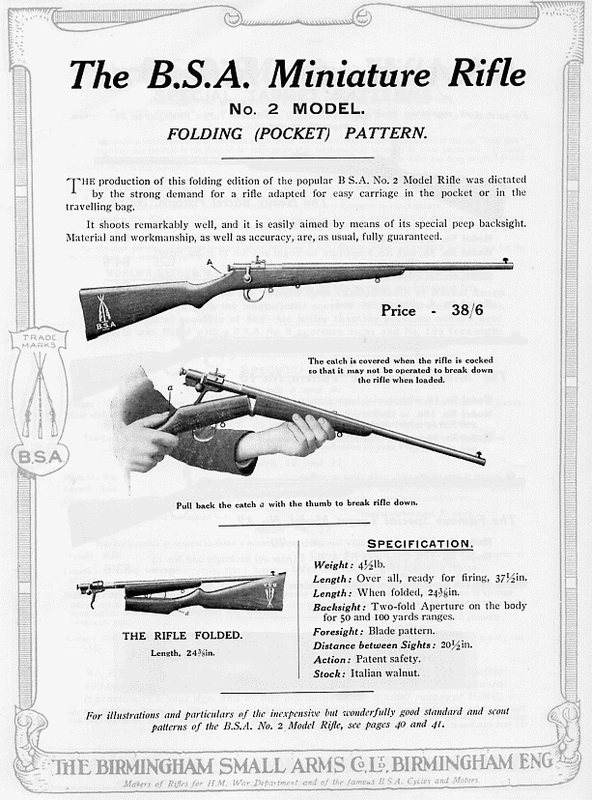 At the time of the above advertisements, in 1912, came a further version of the Model No.2 rifle - a folding option, more intended as a sporting rifle than a target or training model. John Knibbs, in his authoratitive book " The Golden Century" on 100 years of the B.S.A. Co., states that 1,075 of two differently sighted variants were produced between 1912 and 1915. 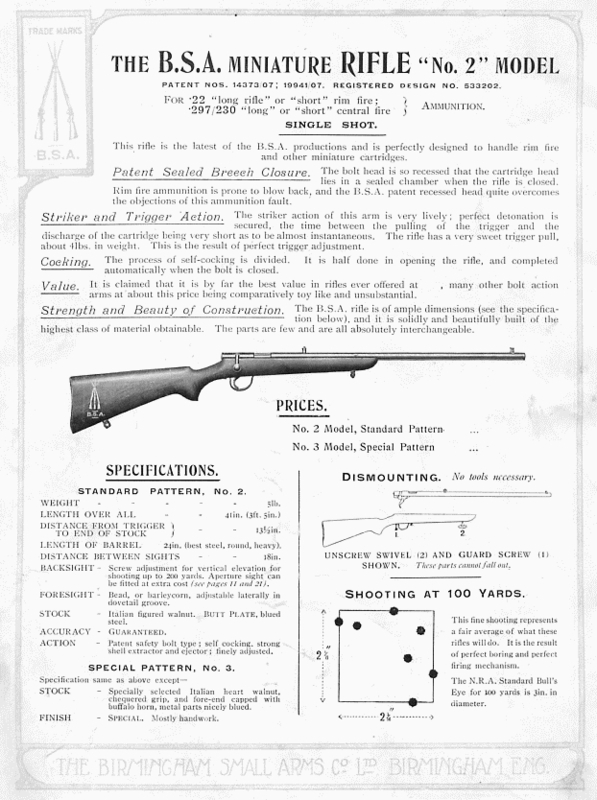 What was probably the earlier model, as advertised at its introduction in 1912, appears to use the standard Model 2 action, with the bolt-handle acting also as the locking-lug. The folding aperture sporting rear-sight is therefore mounted immediately behind the receiver and in front of the bolt-handle. The presumably later version illustrated below has a bolt-handle at the rear of the bolt-body, and the folding rear-sight bridging the rear of the action-body. As discussed above, it will be confirmed, by comparing the relative positions of the flip-over aperture rear-sights in the advertisement above, and the two images of a similar rifle immediately below, that the sight bridge on which the flip-over sights are mounted was, at some point in production, moved rearwards behind the bolt locking-lug slot, perhaps to reduce eye-relief, which may have been slightly excessive with the sights in the forward position. The rifle below still utilises the same style of action body using the locking-lug slot originally for the handle on the initial design, albeit the slot has been moved about a quarter of an inch forward to give the fore and aft length necessary behind it for the fitment of the sight-bridge at the rear of the action, and the handle has been removed from the bolt locking-lug position and fitted at the very rear of the bolt body. The lug, now only of sufficient height to just remain within the thickness of the action body, runs almost out of view beneath the sight-bridge. There is an added cut-out immediately at the rear of the action-body to accommodate the root of the bolt handle. The release catch, for breaking the rifle into the folded position, has a spring-loaded lug that locates in a horizontal "V"-notch detent at the back of the rear mounting block for the folding trigger assembly. 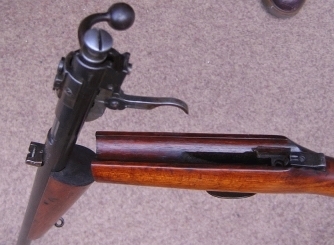 The thumb operated release button is slid rearwards to open the latch and fold the rifle. The thumb release is carefully positioned so that the rifle cannot be broken if the action is cocked. The cocking piece has to be fully forward to access the release button. Another sight modification obviously became necessary when the rifle remained fitted with a barrel-mounted "V" notch rear-sight in addition to the flip-over rear aperture. 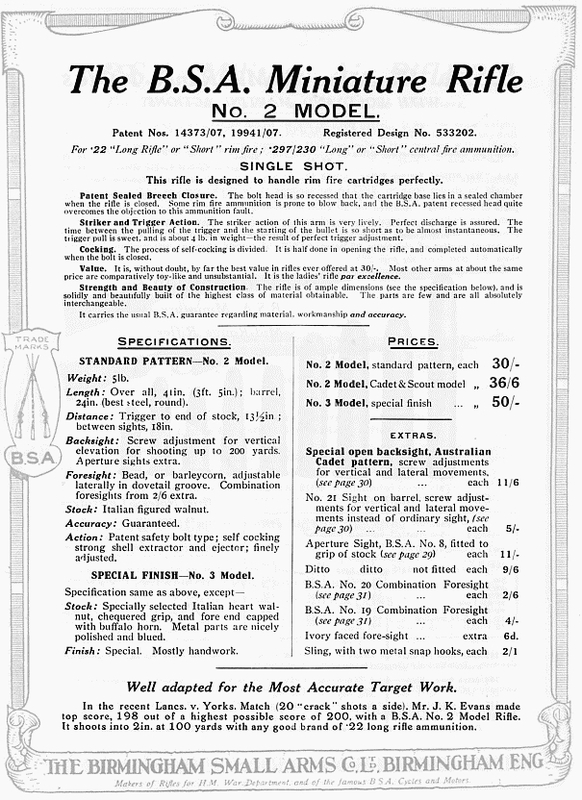 The barrel mounted rearsight is not shown in the advertisement, and the flip-over (50 yard and 100 yard apertures) rear-sight is of a one-piece "L" shaped type, similar to BSA's own small-tunnel fore-sight configuration (the No.19). 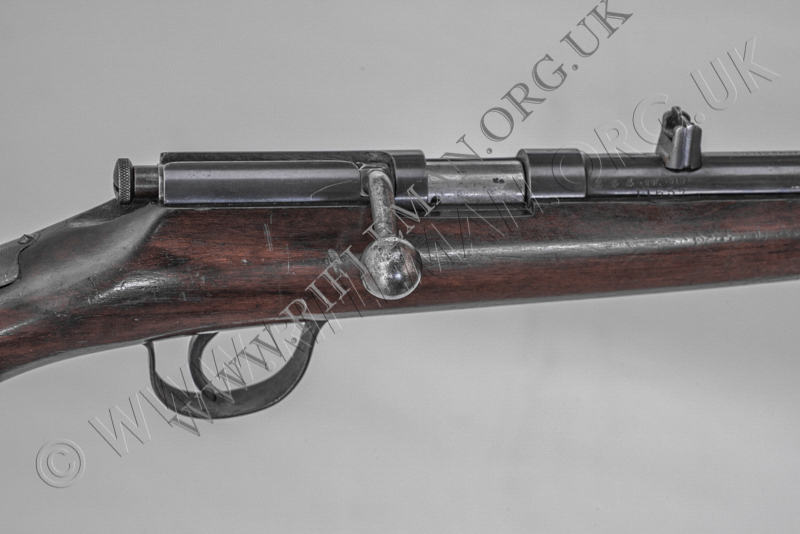 The rifle below, however, is also fitted with a barrel-mounted wind-up "V" notch rear-sight of the type commonly fitted to BSA's basic miniature calibre rifle. 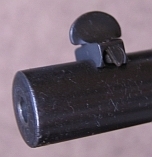 This barrel-mounted sight could patently not be used with the L-shaped aperture rear-sight on the bridge, for one or other of the two apertures would always be in the sight-line. To obviate this problem, the flip-over was replaced with a two-leaf lift-up design, again with 50 and 100 yard leaves, but both capable of being folded flat to free the sight-line for the use of the V-notch. It should be noted that the Model No.2 action usually has the bolt handle in its locking slot 1¼ inches forward of the rear of the action. we have yet to see any copy illustrating the configuration shown on the folding model shown above. We have assumed that the re-positioning of the bolt-handle to the rear of the action was to permit the fitment of the folding leaf sight on these rfiles. drilled either side of the action between the bolt-handle cut-out and the locking-lug slot. lacking only the folding release latch at the rear, so the arrangement was not restricted to only the folding rifles. in his book "BSA - The Golden Century" John Knibbs refers to early 1912-15 rifles as being originally based on Model 1 rifles. writing that the rifle was "probably produced by B.S.A. to make up the quantity for an export order". If you see any documentation of either of the folding or fixed rifles with their rear-postioned bolt-handle we would be grateful to know of it. 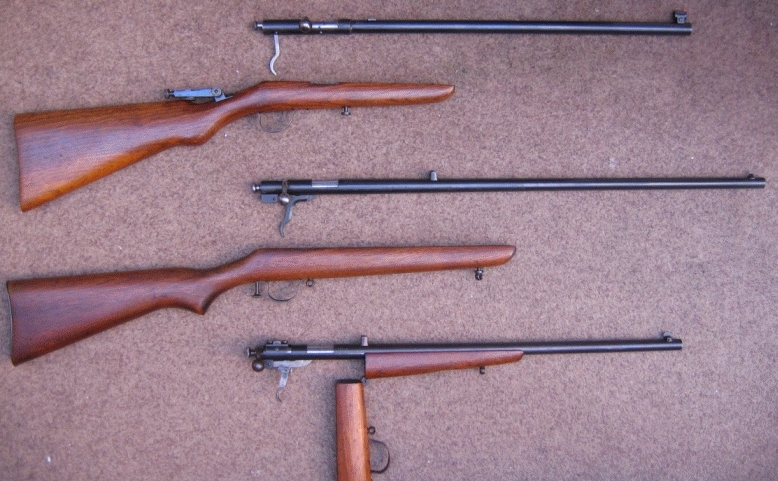 To yet further muddy the waters, we have in our archived collection an as yet unidentified variant of the Models 1,2 & 3 family of rifles - shown below. but there is an additional bridge forward of the bolt-handle locking position - more akin to the layout of the Model No.2 receiver. whereas the standard Model 2 handle is approximately half-way between the rear of the action and the receiver. which suggests that the unidentified rifle was manufactured much earlier, at a time likely to preclude its being a Model 3 variant. The fixed stock rifle with the folder-type ironwork is later than either. The fore-sight on folding model rifle illustrated is of an unidentified basic sporting type, but with a useful laterally threaded component for windage adjustment. 50, 100 and 200 yards. Windage adjustment can only be achieved by tapping the sight across in the barrel dovetail. For model comparison, we show below an image of three rifles in line, two with the barrels and actions removed from their stocks. Top - the Model No.1; Centre - the Model No.2; bottom - the folding "Pocket" Model No.2. The relative bolt handle positions can easily be compared above. 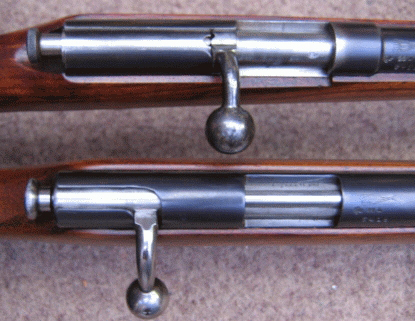 The barrel fixing of the Model No.1 at the top is achieved by dint of a single bedding set-screw, through the fore-end 2 inches in front of the trigger-guard, into the very front of the action-body. 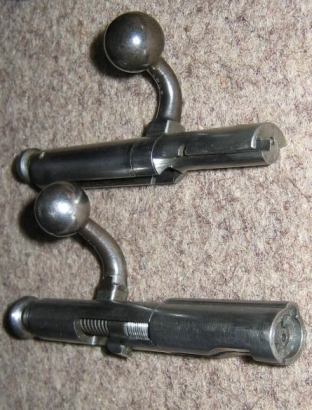 On the Model No.2, there are two bedding bolts; one, near the front of the fore-end, is in the form of a sling-hook eye screwing into the underside of the barrel, whilst the other is the rear set-screw which runs into the trigger unit's rear mounting block under the rear of the action. 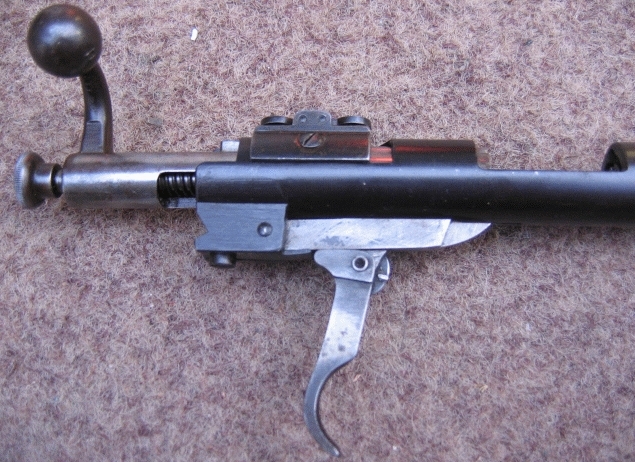 This, of course, is not possible with the folding stock, which has two bedding screws, both into the barrel. The forward screw is as that of the fixed stock No.2, but the rear screw neatly doubles-up as the forward fixing screw of the folding stock hinge. The variance in trigger assembly design may also just be evident in the image above. receiver loading port. A series of three images, right and below, illustrates the arrangement. The folding stock Model No.2 has a trigger to all intents and purposes identical to that of the fixed stock model. There are just two differences. The first is that the forward edge of the machining is not bevelled, probably because this would be superfluous in view of the second difference. The machining is now in two sections; the upper pivoting sear section and the lower trigger section which can now be folded up and locked flush against the upper section by virtue of its own pivoting indented spring-steel disk. This facility was no doubt to prevent the trigger snagging inside one's trousers! Again, there are explanatory images alongside and below. 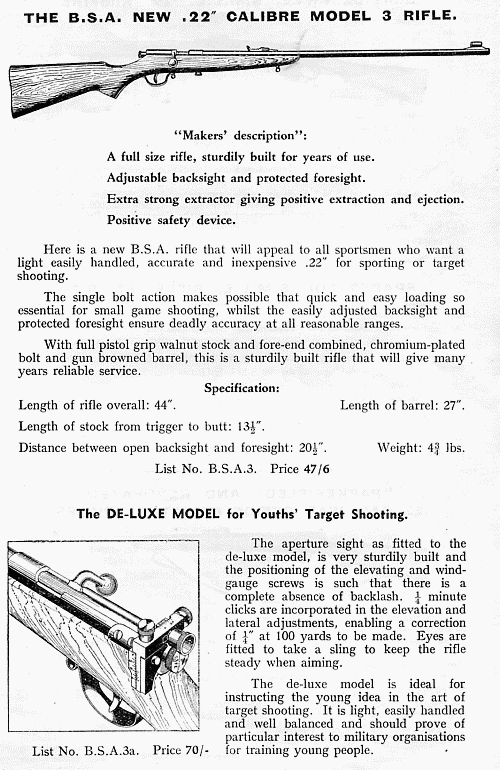 Below: a 1939 advertisement for the now "New" Model 3 rifle. 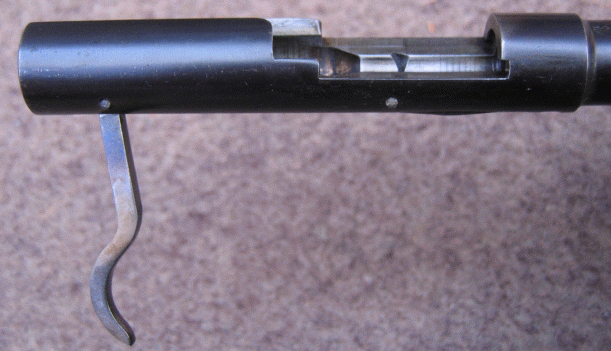 Whilst it purports to be a model further on from the Model 2, the bolt arrangement pictured is as that of the late Model No.1 rifle, with the bolt handle (itself the locking lug) as far forward as it can be, centred 2¼ inches forward of the rear-most extent of the round action body, immediately in the rear of the receiver loading port. It has already been mentioned that the Model No.2 action usually has the bolt handle in its locking slot 1¼ inches forward of the rear of the action.